This is just a short post recounting the two trains I saw on Friday morning. I saw train CN 111 rolling west along the CN Rivers subdivision just after 9 AM. It had CN 2274 in the lead. One challenge with shooting into the sun like this is to avoid blowing the sky out with the high contrast between the dark train and the bright sky. Typically I would focus on the side of the train, which is much darker than the sky. I used the exposure compensation on the camera to step it down 2/3 of a stop. CN 2529 was the second unit and has something odd on the side of the engine over the "5". Is it a rear-view mirror? After the head end passed, I drove west to catch it again. I was surprised to see a train coming the other way. It turned out to be CN 102 and I had just a few seconds to pull over and shoot it. Note the lack of any class lettering under the "5611" on the side of the SD70I. I did get ahead of train 111 and shot it approaching Diamond. I decided to do a pan shot of 2274 this time. I set the shutter speed to 1/80s. After I watched the train pass for a bit, I saw the mid-train engine, CN 8938. While I was in the panning mood, I shot this CN container. "We Deliver!" The train rolled off into the distance, and so did I.
Jody Robinson and Gary Lee both photographed the same train that Steve O'Brien saw in Fredericton Junction, with the two (ex?) 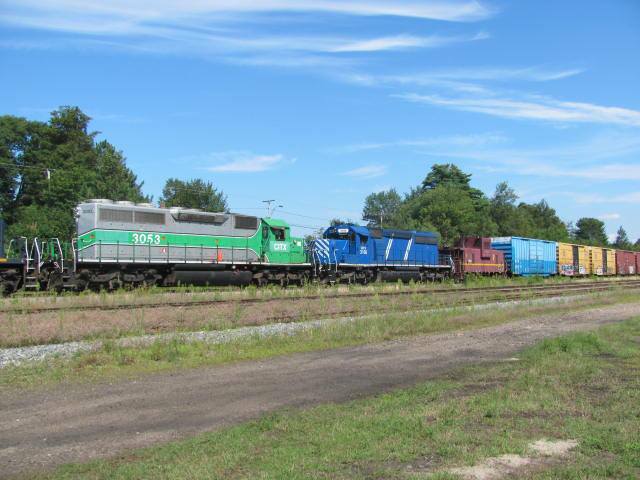 MMA leased engines CITX 3053 and CEFX 3166 and the MMA caboose VB-1 (not VB-4 as previously reported). These were posted to the excellent RailsNB Facebook group. 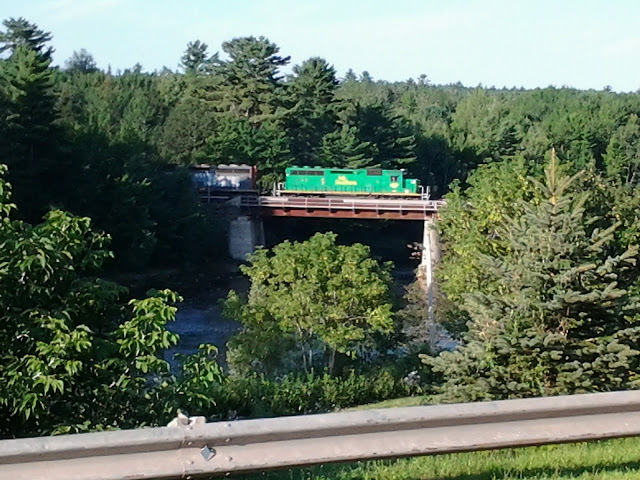 Jody photographed the train in McAdam. Gary Lee was positioned at the St. Croix River, right on the border between Canada and the USA. He had some great light! Note the Canadian and US flags on HLCX 6319. Gary also posted a video of boaters on the river with the train rolling past. PS the MMA is saying they need to rebuild the line through/around Lac-Mégantic to make themselves more salable. Makes sense, but of course there are questions about how polluted the site is and whether it will be on its original routing or around the town. The Lac-Mégantic mayor, Colette Roy-Laroche, is quoted as saying restoring rail service is one of the town's main priorities. PPS the Canadian Senate's Energy, Environment and Natural Resources Committee issued a series of recommendations for transportation of crude oil and natural gas. It's important to note they started this process months before the Lac-Mégantic disaster, although Lac-Mégantic is certainly mentioned in the report. Here's the full report. 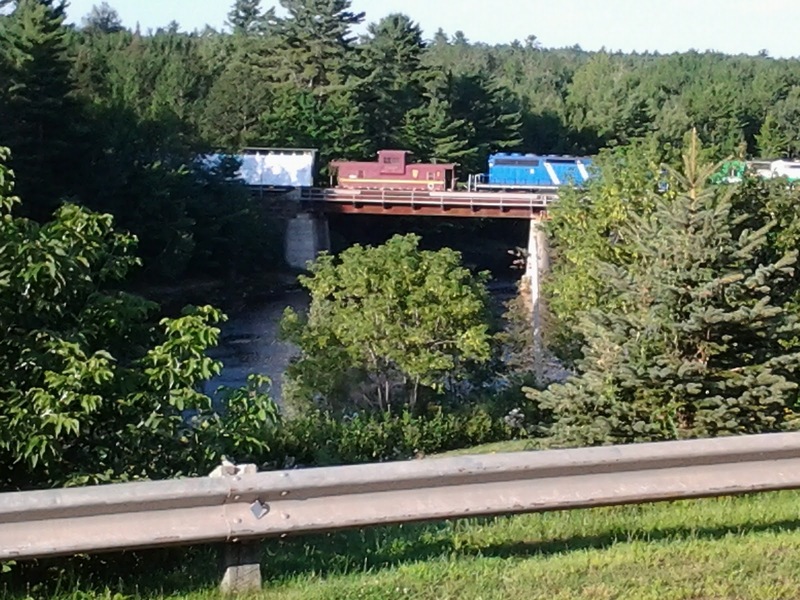 Here's a photo of the ill-fated train somewhere near Farnham, Quebec on its way east showing that MMA 5017 was in the lead. This was prior to parking the train at Nantes and the subsequent runaway and derailment. This photo was taken by Richard Deuso. I don't know who took this photo. 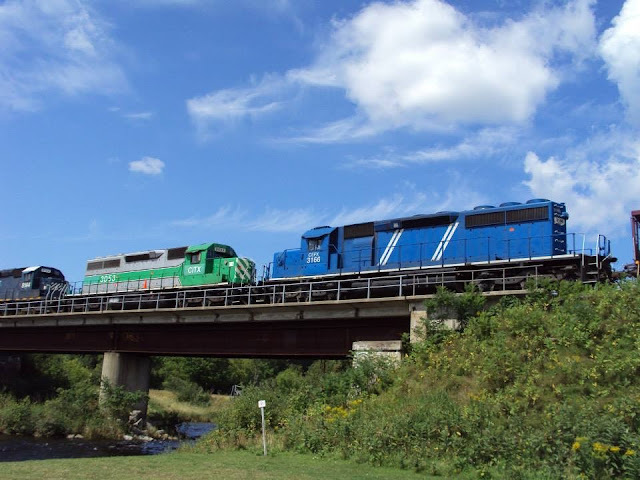 Eagle-eye Steve O'Brien saw the caboose, CITX 3053 and CEFX 3166 depart on a westbound NB Southern train on Friday August 16th. 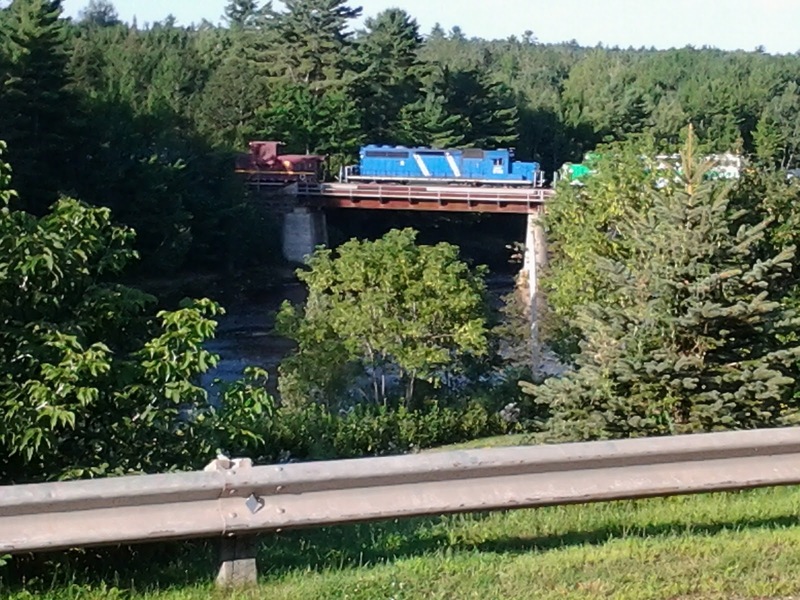 He spotted the train passing through Fredericton Junction at 08:35 and snapped a few photos with his camera phone. 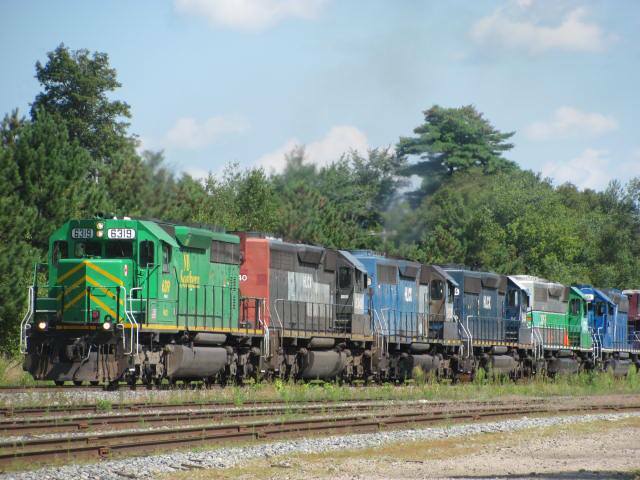 The train had six SD40s in total, with a green NB Southern leased SD40-2 leading, HLCX 6340, HLCX 6332, HLCX 6304, then the MMA leasers CITX 3053 and CEFX 3166 followed by the caboose VB-1 and the rest of the train. 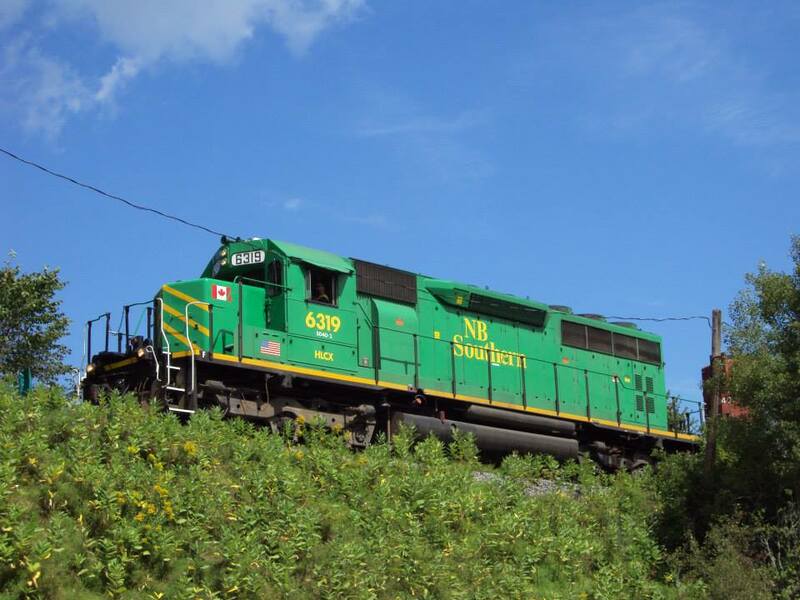 The three MMA C30-7 engines are still in the NB Southern shops as of August 20. It is not known why they are still there. 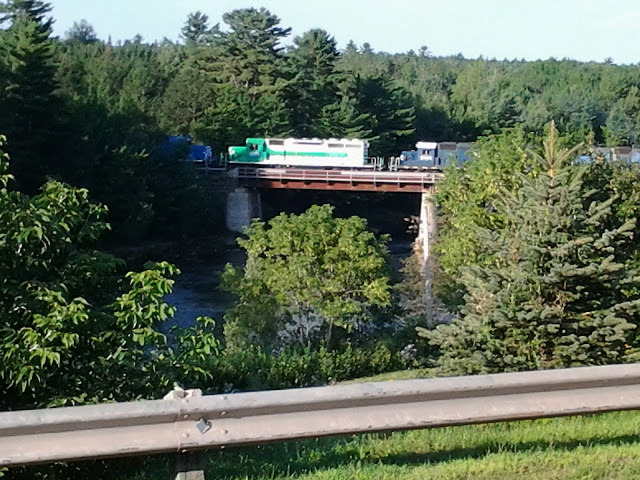 Here are some of Steve's snaps of the train as it crossed the river into Fredericton Junction. NB Southern leased SD40-2 leads a westbound freight. Photo by Steve O'Brien. CITX 3053 in Fredericton Junction. Photo by Steve O'Brien. CEFX 3066 in Fredericton Junction. Photo by Steve O'Brien. MMA caboose VB-4 in Fredericton Junction. Photo by Steve O'Brien. Thanks for sharing those, Steve! 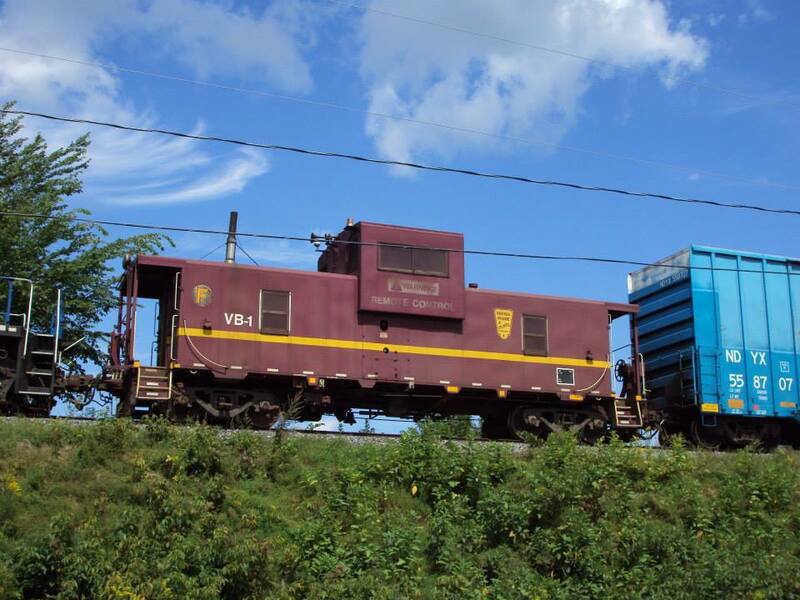 PS Note the caboose on this train was VB-1 yet the caboose on the Lac-Mégantic train was reported to be VB-4. EDIT: Gave credit to Richard Deuso for his MMA photo. Thanks to Steve O'Brien for the update. The Quebec provincial government has added CP Rail to its list of companies deemed responsible for the cleanup of the Lac-Mégantic disaster. The Montreal, Maine and Atlantic (MMA) is on the list, of course, as well as the Western Petroleum Company (owners of the rail cars?) and World Fuel Services (the purchaser of the fuel). The finger-pointing is in full swing. World Fuel Services says they aren't responsible, since they dealt only with CP, and CP subcontracted to MMA. CP is appealing the decision and says they aren't responsible. At least the MMA is not denying they have some responsibility. Let's face it - nobody is going to step up and say they are responsible if they can avoid it. The cleanup costs are going to be huge (estimated at over $200 million) and the class-action suit(s) are going to pile on too (they're already going after CP). It would be crazy for any company (except MMA) to pay now, before any official reports have come out about the accident. Fortunately, the water quality is improving. There's no word yet on the tons of contaminated soil in the "red zone" (explosion area) and what is to be done with that. In other Lac-Mégantic news, the MMA may get an extension to their operating permit since they have said they still have liability insurance. They can operate to October 1 provided they can prove they have liability insurance by August 23. The CBC is reporting that J.D. Irving is considering purchasing the MMA rail lines. This makes a lot of sense, since the MMA line provides their only direct connection with CP in Quebec (see map). Aside: When did the NB Southern web site start referring to the NB&M Railways instead of NB Southern? It looks like someone did a massive search and replace. I looked at archive.org, and apparently the NB Southern web site still said NB Southern on June 21, but now it says NB&M. The End Of The MM&A? The recent railway disaster in Lac-Mégantic, Quebec has ended the lives of 47 people, changed the lives of the town's residents forever, and now it may spell the end of the Montreal, Maine and Atlantic Railway. expected cleanup costs are expected to exceed $200 million, much greater than the value of the insurance plus the value of the company. Under this protection, the company can continue to operate to attempt to operate, provided the judge permits it. However, another blow was struck on Tuesday August 13 when the Canadian Transportation Agency revoked the MMA's license to operate due to a lack of liability insurance. This is an obvious step, since their liability insurance will be fully committed to the Lac-Mégantic cleanup and they're not going to be able to get more insurance. 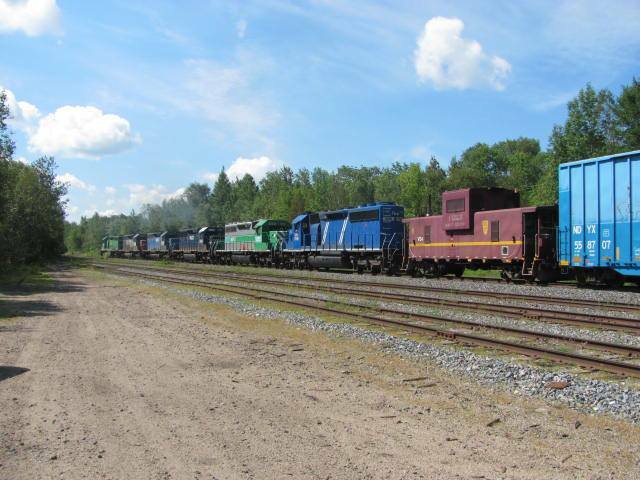 The railway has until August 20 to wind down its Canadian operations. The Agency is going to review other federally regulated railways. This marks the second time that rail line's owner has gone bankrupt, since Iron Road Railways went bankrupt in 2002.